A spinal fusion is simply the uniting of two bony segments, whether a fracture or a vertebral joint. 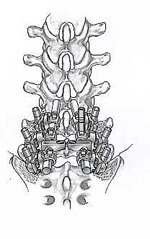 The reason for instrumentation with rods and screws is to act as and ‘internal cast’ to stabilize the vertebra until the fusion, or bony re-growth, can occur. Historically spinal fusions have been used to correct degenerative spondylolisthesis. However, there are many indications for a spinal fusion and it is not the only procedure preformed to treat those various conditions. You should talk to your doctor about what procedure is best for you. The patient is positioned on the operating table in a prone position. The incision is made over the anatomic position of the spinous process. When indicated, soft tissue and bony decompression are performed to relieve neurological compression. For a degenerative spondylolisthesis case, a blunt probe is inserted through the pedicle and into the vertebral body. Once the pedicle canals are prepared and the screw length determined, the screws are sequentially inserted. The facet joint capsules are removed and cancellous bone graft is placed into each facet joint. The transverse processes, sacral alae, and the lateral walls of the facet joints are decorticated with high-speed burs and curettes. Corticocancellous bone graft taken from the iliac crest, along with any fragments of bone taken during decompression are firmly pressed into the bone fusion bed. Once the construct has been assembled, segmental distraction and compression may be carved out. Then a final tightening is performed.